Saturday night's gig was my choice, Sunday night was my brother's. Our musical tastes have some overlap, and some differences. Luckily in Glasgow there is always a variety of musical options and if we had wanted something different again we could have alternatively joined the thousands of people at The Hydro for the "Country To Country" shows. 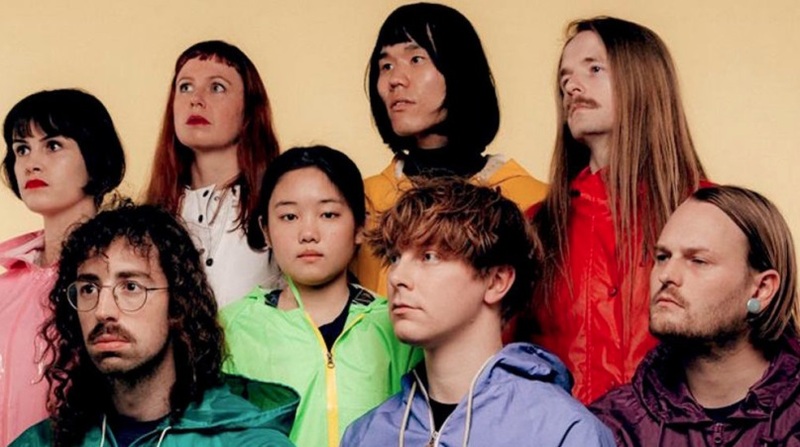 As it was I settled for veteran Jamaican dub reggae musician Lee 'Scratch' Perry on one night, and "BBC Sound of 2018" nominees Superorganism on the other. One night it's all ginger wine and marijuana, the next it's Diet Irn Bru. After the life he has led, first let me say hats off to Lee 'Scratch' Perry for still being here. The 81 year old Jamaican producer largely created the dub style in the 1970s, taking existing reggae tracks, remixing and looping them in the studio to make new tracks. Emphasising the drum and bass, the instrumentals, he was constantly innovating and a whole new musical genre was born. His behaviour can probably be best described as eccentric over the years, from burning down recording studios, communing with aliens and wearing his hat that represents connections to elemental gods. A lifelong belief in the powers of ganja may have a part to play in his personality (his letter to the Japanese Minister of Justice in 1980 in support of Paul McCartney, who had been arrested for allegedly carrying cannabis, maybe best sums up his views on the matter). His tight four-piece band introduce themselves as The Upsetters, the name of Lee Perry's old house band, and they kick things off until the man himself wanders on stage after a couple of tracks. Bedecked in an old braided military coat, wearing his trademark hat and dyed red beard he laughs and sings away, treading a fine line between improvisation and rambling gibberish - not always successfully. The setting of St Lukes as a former church seemed to appeal to him, the old church organ behind him on stage, and the words turn to god and Zion at times. When a fan at the front hands him a large bag of a herbal substance early on, he happily sequesters it away with his suitcase on the stage and throughout the night blithely puffs away on his pipe between songs. 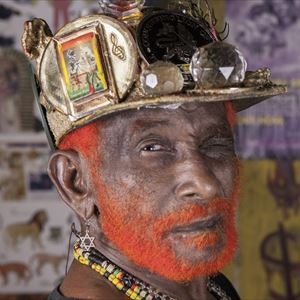 There will be no smoking ban at a Lee 'Scratch' Perry event. Breaking off for a few sips of the ginger wine that he has brought on stage, he mumbles on for an hour and a half, loosening up as the night goes on and seeming to be enjoying himself as much as the collection of Glaswegians in the audience. As has to be noted that the audience have been providing some of the worst excuses for dancing that I may have ever seen. As he wanders off stage during a riff on Bob Marley's 'Exodus' we realise that is exactly what he has done. Long may he reign. Superorganism are an international collective of eight musicians, fronted by 17 year old Orono Noguchi. Their self-titled debut album has just been released last week. They roll into Glasgow on the back of a lot of hype, but don't appear over-awed by it all. A lot of effort has gone into creating a lo-fi, homemade, psychedelic, indie pop sound that gives the album a happy, upbeat vibe full of technological references and hints of dozens of musical influences. On stage everything has been carefully put together too, from the co-ordinated raincoats and video backdrops to the dance moves of backing singers Ruby, Soul and B. It's all a stark contrast to Lee Scratch Perry's shambolic fun the previous night. Orono's insouciant demeanour lets them get away with the contrived wackiness. As proper pop bands should, they batter through a set of 3 minute tunes, smile, wave and look happy. Orono tries to curry favour with the local crowd by glugging down a bottle of Irn Bru throughout the show. Where she got it right in choosing a glass bottle, she made the mistake of going for the sugar-free version, greeted by boos from the audience, much to her bewilderment (in one of the few countries in the world where the local fizzy drink outsells Coca-Cola, nobody seems to have pointed out to her that this teeth-coating, caffeine and sugar concoction is best known as a hangover cure, rather than as a late night thirst quencher). She saves the day by somehow finding a bottle of the full-fat Irn Bru to help with the encore. It is hard to tell how much of the music and backing vocals is played live, with various pre-recorded voices and electronic beeps going off left, right and centre, but it doesn't really matter. They look like they are having fun, and we don't want to put a dampener on it. Everybody Wants To Be Famous and Something For Your M.I.N.D. are the most memorable songs, but there are plenty of others that show there is variety across the album. The overall sound here is of Bis doing Kandy Pop, filtered through The Monkees whilst somebody nearby plays an 80s video game. As I quite like all of these things, that isn't a criticism. Their album lasts little over 30 minutes, as does the concert. A couple more tunes wouldn't have hurt, but they don't seem like they are going to release anything upon the world until it has been finely honed and polished. I hope they have the stamina to keep that going.